If you’ve been initiated into a fraternity or sorority then your children, grandchildren, siblings, and in some cases, your nieces and nephews are then considered a “legacy.” Traditionally, this meant they were given automatic admission into that same fraternity or sorority when it came time for them to join. This morning I was reminded that I was a member of a sorority back in college. Unfortunately for me, the memories of that time are not some of the proudest moments in life. So when I think about my daughter being a “legacy” of those moments, actions, or choices, I cringe. Those are not things I want to pass on to her or to my son. It just so happens that I was listening to the song Broken Vessels this morning, before this reminder. So as I was thinking about what a terrible legacy I was passing on to my children, God’s amazing grace washed over me. Through His amazing grace, I have a new legacy to pass on to my children. I have a legacy of hope, of beauty, of eternal reward and eternal life to pass on to my children. I am so thankful for God. He took the pieces that I chose to throw down and let be broken and shattered and He gathered them and mended them and made me whole. He didn’t do it just for me, but for my children, my grandchildren and all the other “legacies” coming after me. Oh, what a beautiful thing!! I am truly thankful for His amazing grace! These aren’t just lyrics to a song for me. This is my heart’s song this morning! Amazing grace, how sweet the sound, that saved a wretch like me. I once was lost but now I’m found, was blind, but now I see! If faith comes by hearing, then it’s safe to say that it matters what we’re listening to. When I was a little girl, we sang a song that said, “Oh, be careful little ears what you hear…” How true that song is, because this verse tells us that faith comes from hearing. What we are hearing is what leads to our faith. Let’s start with something simple, like childhood. When a kid hears over and over how dumb or nerdy or fat they are, from other kids, they start to believe that. If they hear that they are pretty, smart, or talented, they believe the same. When we watch documentaries, we find they are so easy to believe. Before we’ve even checked the facts, we’ve heard what the experts have said, and our faith in their ‘truth’ is built. Sometimes it is true. Sometimes not so much. When politicians are what we are hearing most, we can begin to believe our salvation or destruction rests on their decisions. Likewise, if I am constantly listening to words that tell me how strong and able I am, but neglect to listen to anything that reminds me of how strong and able God is, I will begin to put my faith in myself. We cannot deceive ourselves. Our faith IS going to come from somewhere. It will come from whatever it is we are hearing right now. And when we aren’t hearing God’s word, our faith is going to come from somewhere else. What is it you are hearing at this time in your life? Is it the word of God? Is it something else? We have voices and noise all around us, in this world, but we cannot conform to what this world tells us. It is not old-fashioned or out-dated to serve the Lord with gladness. It is not going to hold us back in life to renew our minds and prove what the will of God is. When our lives prove that which is good and acceptable and perfect, it shows that we are hearing the right voice. Being a good person isn’t going to cut it. Doing good works won’t save us in the end. Believing in another God is not the way to heaven. When we are hearing God; however, we will know this, and we won’t resent it. We will understand the great rewards that await all who have chosen the narrow and difficult way that leads to eternal life. We have to take our eyes off the circumstances as much as we can and get our eyes on the Lord. He has the ultimate say in this life. Sickness doesn’t get to have the final say. Doctor predictions don’t have the final say. Lawyers and politicians don’t get the last word. God is in control and whether He does what we hope or what He knows is best, He is Sovereign and He still holds His creation in His hands. Keep your eyes on the Lord above. Keep trusting in Him and calling out to Him in your time of need. Run boldly to His throne of grace where you will find help. Find the safety in the refuge of His holy name. Count on His word that is settled in heaven. Believe in the One for whom it is impossible to lie. He is faithful and true. He has defeated death and the grave, and one day He will send His Son, Jesus, to be with Him again for all eternity. Praise God, we are His…now and forevermore! In fact, our eternity has begun now…we are just waiting for Jesus to come get us so we can finish the rest of our eternity in heaven. We are already His. When the bad news comes, we have some wonderful, amazing, praise-worthy news to focus on! God has not left us nor forsaken us. He is with us. We just have keep our eyes on Him and lean in. Not only will He guide and strengthen us, but His Comforter is with us to offer peace every step of the way. Pilate could find no fault in Jesus because there was none. The people took the fault upon themselves, but what struck me this morning was that they not only took the fault upon themselves, but they put it upon their children, as well. Wow! That’s some kind of serious burden and legacy to place upon your own children. What happened between the time he wrote this and the time that Jesus was standing before the people and Pilate? Well, just because one father decides to tell his kids about the Lord doesn’t mean they all do. We know that. That is why people did not recognize the Messiah when He came. He was standing right in front of them, and instead of worshiping and honoring them, they took their blood upon themselves and their own children, crucifying Him. We have the same responsibility today that Asaph had all those years ago, and it doesn’t matter if we are a parent or not. Jesus is going to come back one day for His bride. We must not hide the parables and the truth about our loving Savior and Messiah from the generations around us. We need to tell the praises of the Lord. He is worthy! We need to talk about His strength and His wonderful works that He has done. He is mighty! We can leave a wonderful legacy to the world around us. A legacy of eternal life and reward. There is still time to help those around us recognize the Messiah and give Him honor. Get involved in sharing the gospel one way or another. Don’t let someone meet their Messiah unprepared because you weren’t willing to open your mouth. Let’s follow Asaph’s example and leave the legacy of hope they’ve been granted through grace. Thank You, Jesus Christ, for our salvation through Your death and resurrection! Thank You for Your grace, mercy, and forgiveness through the cross! We praise You, and You alone, our King of Kings and Lord of Lords! Amen. Oh, I have travelled on those paths too many times. I want to remind us today that we are told to turn away and pass on. There are good reasons for this. Today happens to be the birthday of a dear friend of mine from back in high school. Sadly, we can’t celebrate together because he passed away several years ago. There was a night when he chose to take the wrong path. He made some poor decisions with some friends. Afterwards, when his judgment was impaired and his decision-making was affected, he chose to literally walk on the exact wrong path…a busy road, where he was hit and killed by a vehicle as he walked. God’s warnings are for our protection. He wants to protect us from the consequences of sin. Satan always lies and tells us that there aren’t any. He says that our decisions are our own and they won’t affect anyone else. He convinces us that we can repent at a later time. Friends, there may not be a later time! My friend did not have a later time. He took the wrong path and he is gone. Thanks to God’s grace, you and I have been given more time, another chance to turn away and pass on. Let’s do that. Let’s make that choice and be better off for it. There is protection for us here and eternal life for us on the other side of this life! It’s never too late to turn back! Even if you’re on the verge of total ruin, God’s forgiveness and grace is still available. Don’t take another step towards ruination. God is willing to forgive and make you a new creation. You just have to ask. Father, I come to You right now, confessing my sins against you. Lord, Your word says that forgiveness is available through Your Son, Jesus Christ. Right now I need that forgiveness. Have mercy on me now, God, and cleanse me. Turn my feet from the path of ruin to the path of eternal life. Lord, I no longer desire to live for myself and for my own desires, but long to live a life that is pleasing and useful for You. Through the power of Your Holy Spirit, I ask that You guide me the rest of my days. Thank You for salvation and forgiveness. I love You, Lord. In Jesus Christ’s saving name, Amen. I am rejoicing with exceedingly great joy tonight as I am reminded that the child they saw was the One who came to bring me salvation! He came to bring salvation to us all. 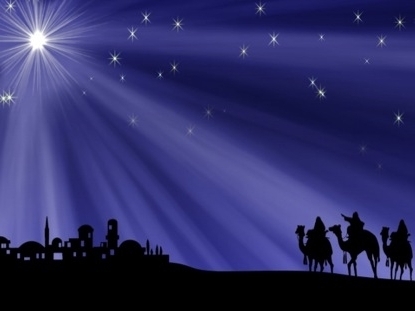 I thank God tonight for that star’s reminder that our Savior came for each of us. His love for us is so great that He sent His only Son to this earth–for us. Thank You, Lord, for our Salvation. Thank you for our Savior, which is Christ, the Lord. Thank You for choosing to give us eternal life with You. Thank You for the hope and the promise in that star. Lord, help each one reading this feel the hope of Your salvation upon them, as well. You are a good, good God. I praise Your Holy name!